The Garuda King Class: Bangalore to Thrissur! 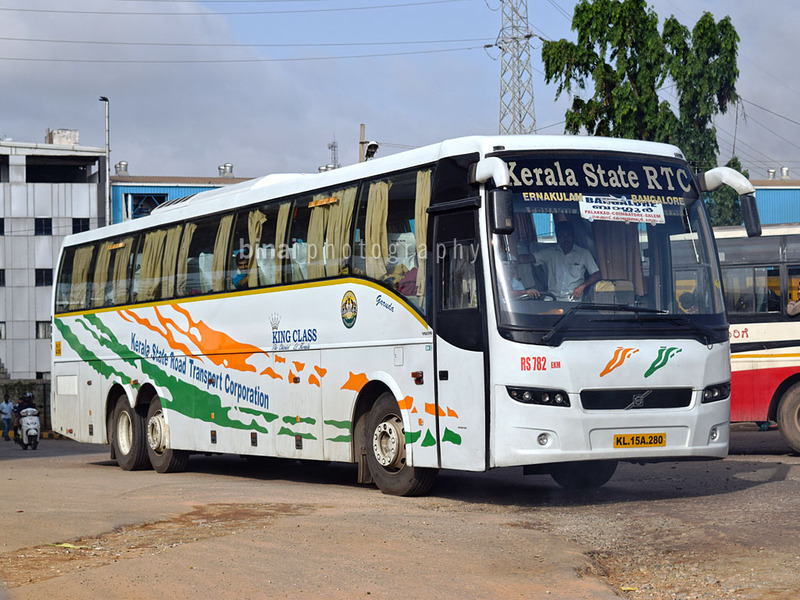 My last journey by a Kerala State Road Transport Corporation (hereinafter referred to as KSRTC) Volvo Multi-axle bus was back in October 2015. Although I made an attempt to travel in one in November 2015, I got their Scania trial bus instead. I had a trip to Kerala imminently. As soon as the date got fixed, I booked in a KSRTC bus, without too much thinking. 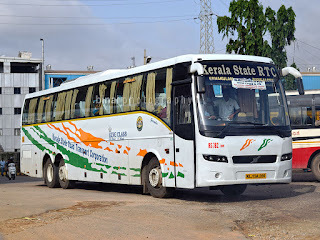 The reasons were aplenty - One, I hadn't traveled in one for quite some time, two, they dropped me in Thrissur town (which most private operators don't do), three, they were damn cheap (at Rs. 785, this was a steal) since it was a weekday, and four, they'd pick me up from near my office (college)! The Volvo Multi-axle fleet of KSRTC was recently christened as Garuda King Class. This happened soon after their fleet of Scania buses were inducted, which got the name Garuda Maharaja. The brand isn't used widely yet, and the reservation portal still prefers to call it AC Multiaxle. KSRTC introduced flexi fares a few months back, under which they dole out discounts on weekdays, and charge higher on weekends. They also started operating a few buses to Peenya Basaveshwara Bus Station - a godforsaken facility along Tumkur road - in October 2015. Since this bus station is very close to my workplace, it made very high sense to opt for this service. I opted for the Ernakulam bus because it was the last bus, and had fairly good arrival time at Thrissur. So, cutting the story short.. I was getting restless and excited as the clock slowly ticked towards 1700hrs - our official punch out timing. I fired up the Ola app at 1659hrs and hunted for cabs around the region - a cab got confirmed quite soon. I punched out at 1701hrs from office and ran towards the gate - since the app showed that the cab had already arrived - but the location on the map did not coincide with the location I was in. I quickly realised that the cabbie was taking me for a ride, and he was doing a fake trip to complete the numbers he needs to get his incentive. I called up the Ola helpline, who were really helpful and terminated that booking along with a full refund of money that was deducted from my wallet. I booked another cab, who was, thankfully, around the same area as my office. The cabbie was quite shocked to see me getting off at the deserted bus station - he asked me a couple of times if that was the right location. He actually parked his car and went inside the bus station to find what all buses depart from there. The bus: RS782, shot a few days before the journey. Basaveshwara Bus Station in Peenya, Bangalore, was opened a couple of years back in an attempt to decongest the city and shift buses that go towards Tumkur there. But the plan fizzled out after passengers decided to boycott the shift and moved towards private carriers, who had absolutely no restrictions in operating to the city. After the plan backfired, the bus services were shifted back to the city, and this bus station became a parking yard for buses that are otherwise parked around the city. 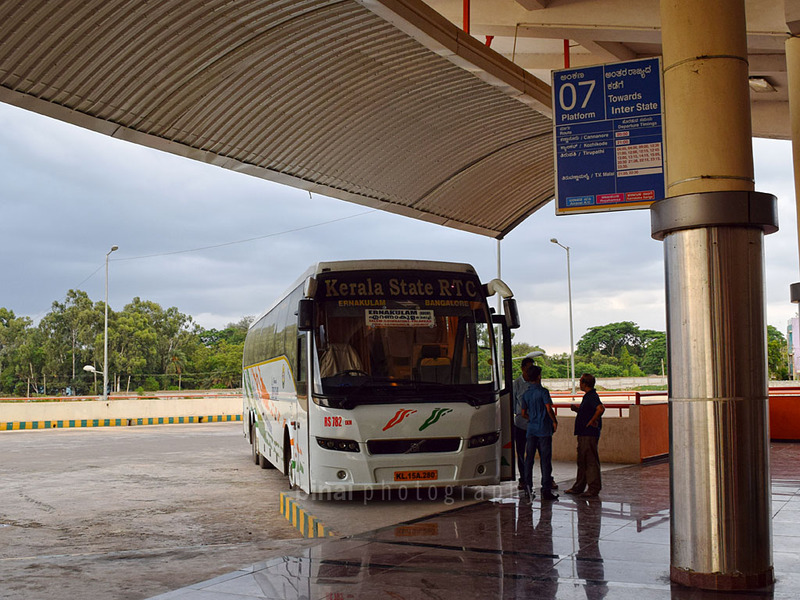 KSRTC was coerced to shift to this bus station in October 2015, when a few services were moved here. It did get average reception from the large keralite diaspora residing around the bus station area. But the bus station is quite isolated, and absolutely lacks public transportation - the nearest bus stop is over 1.5kms away. Back to the story.. I headed straight to the ticketing office, to find a known person on duty there. We spent sometime talking. In the meantime, my bus - RS782 - woke up, growled a bit, and slowly crawled towards the platform from its parking place. The engine sound (more of a clatter) is music to my ears. The conductor also came to the ticket counter and we all stood talking for quite some time - the bus station being in a very isolated place makes life hell for the crew. There are hardly any eating options around - not even roadside vendors. They either have to bring something when they come or adjust with stuff like buns or biscuits. I felt really bad for the crew and the ticketing counter staff. Since the time was inching closer to 1815hrs (the scheduled departure time from Peenya), the conductor asked for the boarding chart - which showed some 27 bookings, of which about 7 people were to board from there. Only three were on board (including yours truly) though! The conductor hurried calling others - since it was quite cloudy and a rain looked imminent. Traffic would get horrible if it rained and the crew wanted to leave quickly. But then, we got delayed since the other passengers did not pick the call, and we started only at 1822hrs. Traffic had already built up - the driver had a really bad time entering the Jalahalli village road. I kept wondering whey they went towards Jalahalli instead of doing through HMT. A little after we passenger Gangamma Circle, I headed to the cabin and asked the crew if they were aware of the route via HMT - the driver quickly said that he isn't sure of that route and hence takes this route! This one is circuitous and is always chocked! I advised them the route via HMT. We crawled through traffic, and fairly heavy rain to reach Mathikere (1853hrs), where a lady boarded. Since it was raining, the crew couldn't open the luggage hold and instead asked her to dump it in the cabin itself. Rain got even harder as we proceeded towards Mysore road. Although the original route is via Vijayanagar, the crew usually go through Yeshwantpur, Goreguntepalya, Outer ring road to reach Mysore Road Satellite bus station (which continues to be the operating base). Traffic was heavy all the way till Goreguntepalya - thanks to the rains, all bikers had parked their vehicles on the roadside, gobbling up a full lane, and leaving only one lane for other vehicles. Once past Goreguntepalya, the driver opened up a bit and picked pace. We reached Mysore Road Satellite bus station at 1957 - with three minutes to spare for the scheduled departure time. The bus station was packed - and no platforms were available for us. I got off the bus with the conductor and headed to the operating office - to meet my acquaintances there. The reservation chart is prepared here and the bus was signed off from there - we had 33 bookings now! When returned to the departures bay and the bus was still parked away due to the lack of platforms. Finally we found an empty platform and brought the bus there and boarding commenced. We were already behind schedule now. We started off from there at 2015hrs, but it was 2019hrs by the time we exited from the bus station. The driver sped up wherever he could - and quite surprisingly traffic was low despite the rains. We reached Shantinagar bus station by 2048hrs - in less than 30 minutes from Satellite - which is an achievement of sorts for a weekday! We completed boarding real quick and even managed to get a couple of walk in passengers - and started from there by 2051hrs. By now, passengers waiting at Madiwala started calling the crew on their mobiles. Traffic was light after Shantinagar as well - helping us to reach Madiwala (St. Johns Hospital bus stop) by 2107hrs. Majority of the passengers joined here and it took sometime to complete boarding. We started off at 2112hrs - with a grand total of 37 passengers on board. Thats a fairly good number for a weekday. Since all the reserved passengers were on board, and traffic after Silkboard was high, the crew opted to take the elevated highway. The driver let the beast loose on the elevated highway - but the 80kmph lock was a harness on the 340 horses available at the driver's disposal. A movie was now played on the TV and the driver settled down for his long drive ahead. Although I had watched that movie earlier, I was quite attracted to the movie, and spent the rest of my time watching it. We passed Attibele at 2151hrs - not much of a traffic there, either. I was quite hungry now, and was badly looking forward for the dinner break. We finally pulled in to Hotel Saravana Bhavan Classic in Kurubarapalli, before Krishnagiri, for our dinner, at 2232hrs. The engine was shut down and the crew announced a 20 minute break and walked away. We finished dinner and started off again at 2259hrs. I remained awake for some more time - and fell asleep even before the movie finished. I had a very nice sleep - a long continuous one actually. I got up only when the lights were switched on and the conductor shouted out - Palakkad! We were entering the bus station then (0357hrs) - I was quite shocked as my rubbed my eyes to confirm it was Palakkad indeed! We travelled from Krishnagiri to Palakkad in hardly 5 hours, with a bus locked at 80kmph! Some seriously skilled driver indeed! The stop was quick, and we started off again at 0401hrs. They did not refuel, which used be the case earlier. I dozed off again - but vaguely remember experiencing the bus enter the highway. I woke up again only as the lights came on again - the time was 0508hrs, and we were at Mannuthy! Just over an hour from Palakkad to Mannuthy! Great going again! I pulled up my backrest and sat upright, since I was sure that I'd doze off again. We finally pulled into Thrissur bus station at 0518hrs - 8h06m after we started from Madiwala, including a 27 minute break for dinner! Exactly the time private operators take! Although this arrival was almost an hour behind the scheduled arrival time - I'd not consider them late, since the scheduled arrival time (0420hrs) is terribly overestimated and impractical unless this is the sole vehicle on the road! The bus, RS782 - KL-15-A-280, had clocked over 4.33 lakh kms. The bus made absolutely no unexpected noises - the suspension setups were really silent. The driving was amazing - absolutely no honking after we left Attibele and all lane changes were signalled in advance. The driver did not cut across rashly anywhere or brake hard either. I absolutely loved the driving and gave a nice warm smile and a see you as I got off the bus - the poor fellow drives over 13 hours at a stretch, including over 3 hours in Bangalore city itself! I absolutely loved the service this time - blankets were kept on the seat and the conductor went around and asked everyone if they got one as well. Water bottles were given only on request, though. This was my fourth trip in the same bus - and it hasn't deteriorated even a bit from what it was on my first trip - in May 2014!! Overall a great show by the crew! Will I take this service again? Absolutely YES! Made me recollect the journeys in one of my favourite buses to Bangalore till last year; and its great to know that still they maintain the same quality even today. My maiden trip was on the bus's second voyage - the date was 13th May 2014; if I remember correctly. Yes. I travelled on the first trip on May 11, 2014. Club Class'd: Bangalore to Ooty! Kozhikode to Bangalore: Garuda King Class! Bangalore to Chitradurga: KSRTC Airavat! Bangalore to Mangalore on Durgamba Volvo B9R! Davanagere to Bangalore: KSRTC Airavat! On the Jan Shatabdi to Davangere..